We're trying to stop having Sean watch so much TV (mostly for selfish reasons... Jamie and I are SO burnt out on Mickey Mouse Clubhouse and Handy Manny). But, we know too much TV is not a good thing either. Thus enters the books! 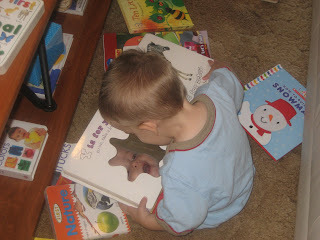 When he gets to reading, he has to have lots of books out - afterall, you never know what you are going to be in the mood to read! 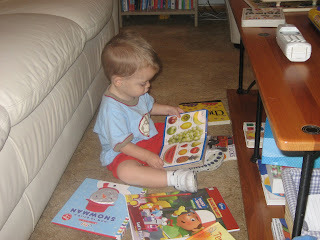 I love this picture... it's an alphabet book that has a picture for each letter. When it comes to "Y", there is a mirror to look at "you". Sean giggles every time he sees his reflection and always gives himself kisses in the mirror. Gee, where would he get that from?!? 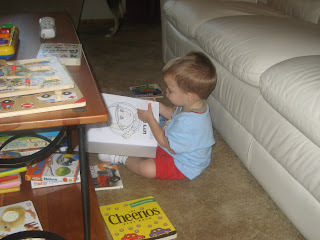 Of course he's reading Handy Manny! How cute!!!! He looks so studious!